Sorry guys, I haven't been feeling the whole blogging thing lately. I went through another stage of feeling like we really don't need a blog until we have kids. I guess that will just have to be sooner rather than later so people will read our blog! ha totally kidding... I'm not pregnant or anything. So whenever you run into people that you haven't seen in forever they ask you whats new and what have you been up to? Honestly? not a whole lot. Does anyone ever have a really good answer for that? It will be great one day when i can say, oh actually we bought a house last week, or oh didn't you know, i have had 2 kids since i last saw you. But at this stage in life where both Cisco and I are in school, not a whole lot changes. But that doesn't mean we have wasted our days doing nothing. I have had some very significant things happen and discoveries take place. 1. Ice cream REALLY does taste better when eaten straight out of the carton. 2. No matter how many times I try it, nuts just do not belong in desserts (especially ice cream, hence why i have been eating out of the ice cream carton: so i can pick around the nuts). 3. I am still addicted to reading. I have read 3 books since school started last week. I don't know how i do it. It's not like i sit home and read all day either. I go to school full time, work 20 hours a week, come home and make dinner and usually watch a show with Cisco and yet i still manage to read a lot. By the way, I think this one is real. I think i really might be addicted to reading a little. I spent this summer working at Promise for Women and Families which is a drug addiction rehab center and every time they were talking about addictive personalities I could apply most of them to my reading. Don't worry, i started taking a few steps in the right direction. Glad I got help before I quit my job and had to sell things to pay for my books... only kidding. 4. 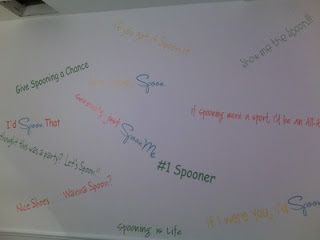 Spoon Me in Provo has the FUNNIEST bathrooms in all of Provo I am sure of it. They have all these common sayings but where a word is replaced by spoon... only people have ripped the S sticker and the N sticker off so now all of the sayings say "poo". haha not sure how they didn't see that one coming. So comforting to go to the bathroom and read things like "nice shoes.....wanna poo?" and "if poo ing were a sport, I'd be an all-star" etc. Here is a picture i found of the bathrooms when they first opened (probably the Salt Lake location) but just try to read some of them and imagine what they look like now. Seriously potty humor (in every sense) but they made me laugh because they haven't fixed them so they probably don't care. too funny. 5. Cisco is in love with a new book series, Percy Jackson and the Olympians. They are short, fast reads but i really like them too. 6. 10:00 still are not a realistic possibility... shame. 7. When I tell people 10:00 classes are not doable, the first thing they say is "what are you going to do when you have kids? Kids don't sleep in till 10." Thank you. I had never thought about that in my years of sleep problems. I am so glad you have enlightened me so that i will miraculously be able to change my ways to have kids or just avoid having kids at all. Ok, this one was a little bit of venting but it makes me laugh how many times i get that told to me in a week. 8. Cisco got an Internship at the Hospital in Cardiac Rehab working with a physical therapist and is way excited to start. 9. I get restless/antsy/fidgety way too soon. We have lived in this apartment 9 months and I am already thinking "how can I rearrange our furniture for something new?" We have a very small apartment and there isn't exactly a lot of options for rearranging. Not to mention we have things were they are because that is the most convenient and they are pretty heavy to move but alas, i will find a way. I can't change up the apartment with decor because we are super poor college students. 10. Oh, and I applied for graduation today. Cougar class of April 2011 (took me long enough). I will be graduating along with Casey, Nicole (masters), my cousin James, his new wife Taryn, my cousin Julie (masters), and the other thousands graduating that day, but still, that is a lot of people i know all graduating at the same time. Fun! Oh and an edit to add #11, I did dye my hair brown and like it a lot. Seriously, pictures of my hair through the ages is coming soon. It has been in the works for a long time. Long lost friend: "So Michelle how are you?! What's new what have you been up to??" Me: "Oh not much, just eating ice cream from the carton, still hating nuts in my desserts, battling my addiction to reading, laughing at potty jokes, watching Cisco read, sleeping in late, realizing having kids isn't going to be a walk in the park, cheering Cisco on while he is in the Cardiac Rehab for the next few months, getting restless and ready for change and applying for graduation. So yeah, not much. What about you??!" Oh Michelle! I miss you! Let's hang out this Saturday. Okay? And at least you have 11 things on your list....I have maybe 3! Ha! You are so funny. I remember those days when people would ask us the same question, and I felt so lame with nothing to say. But it sure sounds like you have you hands quite full. You are a serious reader. I can hardly manage to finish one book each month for my book group. Wish I had you skills. p.s. where did you get your font? It seriously looks just like YOUR handwriting!